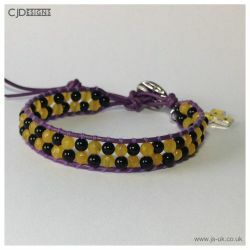 Double row gemstone & leather cuff bracelet by JS-UK. Gemstones used are black onxy, amethyst and chalcedony. I have suffered Fibromialgia for four years. I am 61 years old. I have muddled along had to fight PIP. There is still a lot of people who do not recognize it. They do not believe it is as painful and debilitating. I have only just found FMA. Wow what a site. Information about all aspects of FM. Proof that it exists.